Inspired by Katie at Storytime Secrets and Anne at So Tomorrow, I took my own turn using this template from PurlBee, which I found on Pinterest. A caterpillar! Munch munch munch! A horse! Munch munch munch! A pig! Munch munch munch! A bird! Munch munch munch! A scarecrow! Munch munch munch! I’m planning on using finger puppets to “munch” the apple. 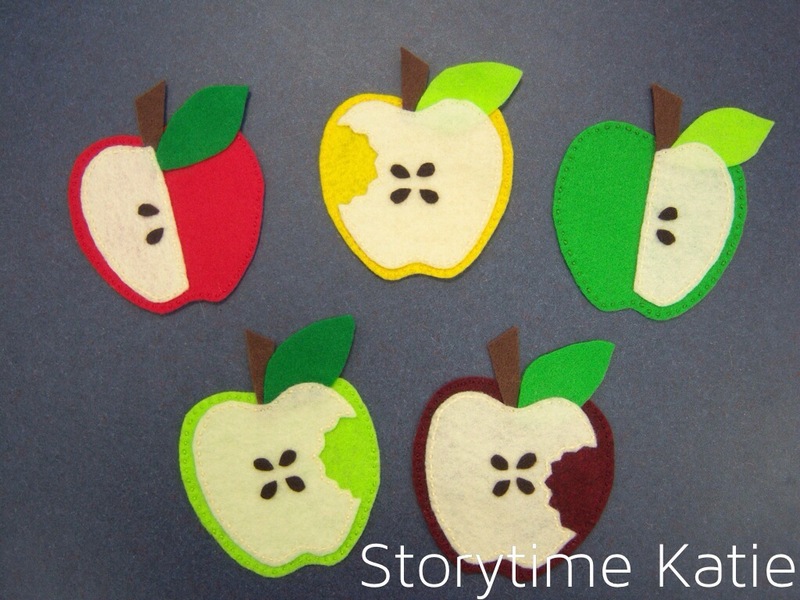 Each apple has a plain side and a side with a bite/half missing from it, so I’m going to flip the apples after the puppet takes a bite. Melissa has the round-up on her blog, Mel’s Desk today. If you participate in Flannel Friday, make sure to leave a comment there to add your post to the list! The idea to show the inside of the apple and the bite is great. I just made a set of these to use in October. Thanks for the idea!